After 30 days of living 80 feet up in an oak tree halting blasting above Bee Tree holler on Coal River Mountain, Catherine Ann has descended from her tree and is heading home. She spent most of the day packing up and carrying down her stuff from the trees in attempts to haul it out of the forest with her. However, the officers would not let her carry out all that she had. This afternoon police took her into custody and drove her off the mine site to magistrate court. Magistrate Charles R. Humphrey released her on personal recognizance this evening and charged with one count of trespass (asked to leave) and one count of conspiracy. She was initially charged with littering, but that was dropped. Read Catherine Ann’s post-arrest statement and watch for more details about her descent soon. Please donate to the general fund to support more actions like this one. Thank you so much for all the support over the past 30 days! Stay tuned for more to come- The fight is not over! 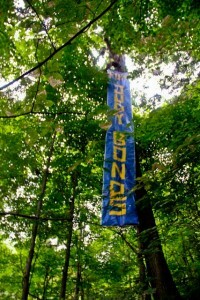 This entry was posted on Thursday, August 18th, 2011 at 10:23 pm	and is filed under action, Alpha Natural Resources, Coal River Mountain, tree sit, treesit legal. You can follow any responses to this entry through the RSS 2.0 feed. You can leave a response, or trackback from your own site.